"Just wanted you to know what a FANTASTIC job you did on our custom order. Your team was VERY helpful in getting me all the info I needed and going over everything so the order would be exactly how we needed it. Our client was very pleased with the printing, as am I!" This under-utilized marketing concept is perfect for increasing customer engagement and campaign lift. Rip cards are ideal for a number of specialized, printed marketing materials. These 2-in-1, promotional postcards serve dual purposes. They give you more advertising space and allow you to attach a removable tab that can house a business or discount card. 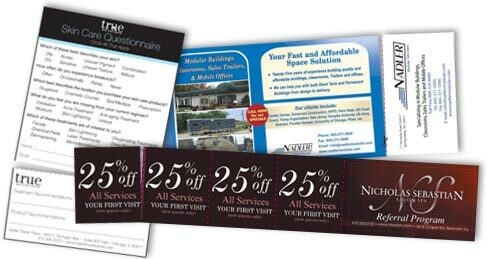 A postcard with perforation allows fun, interactive customizing of your marketing campaign. We specialize in doing the difficult. One unique perforated postcard project is highlighted on our Blog. Custom printing is our specialty. Don't be afraid to call and talk to a printing expert to help you get the finished product you want. Be creative with your custom rip card design. A variety of finishes, sizes and card stocks are available. Unique design can make the concept memorable as well. For example; a weight loss clinic could make a layout with a person's stomach over the perforation. When the tear off is removed, it "slims" the overweight image. The card could read, "We Are Here To Help You Remove Those Extra Pounds: Tear off this card for 25% off your personalized weight loss program." Many real estate professionals make use of rip cards. The main portion of the card is a highlight of one or two listings. Images and listing specifics are housed on this portion of the card. The tear off piece is the agent's business card. Insurance agents are another ideal candidate for rip cards. The insurance ad, with rates or benefits, is the primary portion of the card. The remaining area is a tear off business card. 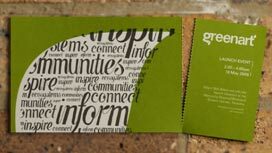 Creative professionals, musicians, charitable organizations, and special event companies often incorporate perforated post cards to promote both their brand and a specific event, product, or service. In this case, the ticket, or event stub, is the smaller portion of the card. A branding advertisement is then placed on the larger portion which the customer keeps. We are ready to work with you to produce a rip card that fits your exact requirements. Call 800-­930-2423 for a rip card price quote, or use the form below.